The Monthly GSTR-3B Filed Report gives a user the data of all GSTR-3B returns of any particular GSTIN. A user can get real-time status updates of GSTR-3B returns which have been filed, and which are still pending to be filed. Users can download this data and use the same for comparison with the books of accounts, and for the preparation of the annual return. The Monthly GSTR-3B Filed Report helps a user stay up-to-date with the real-time status of all GSTR-3B returns for any particular GSTIN. A user can check this data across multiple GSTINs, and across multiple branches. A user can get separate comparable data of all past returns filed, which can be stored and shared with stakeholders and clients. This report can help avoid notices by the tax department. In turn, this helps the taxpayer keep track of his returns filed, and stay 100% compliant. ClearTax GST offers easy import and download of GST data for preparation of GST returns. It provides various options for a user to ingest data to prepare the GSTR-1, GSTR-3B or GSTR-4 in minutes. Options like excel ingestion or direct integration with ERP are available for importing sales or purchase data into ClearTax GST software. 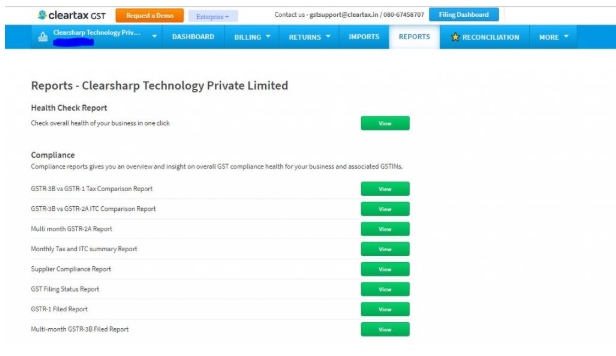 Cleartax GST also provides useful insights with its GST Health Check Report, so you can now speed through the journey of GST compliance in a hassle-free way! One such report is the ‘Monthly GSTR-3B Filed Report’; this report can be obtained for any time period. Even if the user has not filed the return on the Cleartax GST software in the past, the report section will allow the user to download this data from the GST portal. This report will help the user analyse and compare the tax liabilities as well as the input tax credit claimed. It would also help the user understand the input tax credit utilised from both, cash and credit ledgers. This will be particularly useful when preparing the annual GST returns. A user dealing with multiple GSTINs, be it several branches, or clients, can easily get the real-time status of all GSTR-3Bs in one place. A taxpayer can download data from the GSTN at the click of a button, even if he hasn’t been filing returns using the Cleartax GST software. This report can help taxpayers get summary data for easy comparison with books of accounts and GST annual return. This report can be downloaded in the excel format for sharing within an organisation. In the case of CA firms, this report can be easily shared with clients. Login to your Cleartax GST account. Go to the ‘Reports’ section, click on view ‘Health Check Report’, click ‘Generate Report’. Enter GSTN credentials and get the Multi-month GSTR-3B filed Report in Excel format.